We got off to a little bit of a late start. Let’s face it, that’s not that unusual. Some hikers came prepared with entertainment. Aspinwall has some really charming and well-cared for houses in dense blocks. Then you head up Centre Avenue, climb a massive hill and see the ominous Heidelberg. 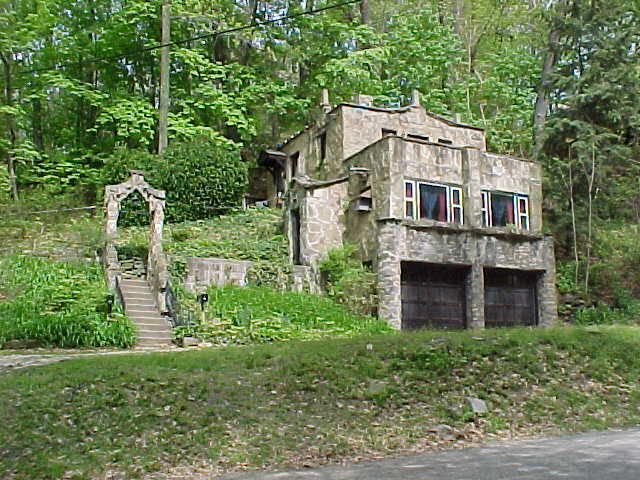 Bavarian architect Frederick Sauer built these mini-castles to remind him of home. There are nine buildings in all on about 30 acres of land. We continue up the hill and into a park, which has a couple seesaws, horseshoe pits and a grassy area that’s probably great for frisbee. 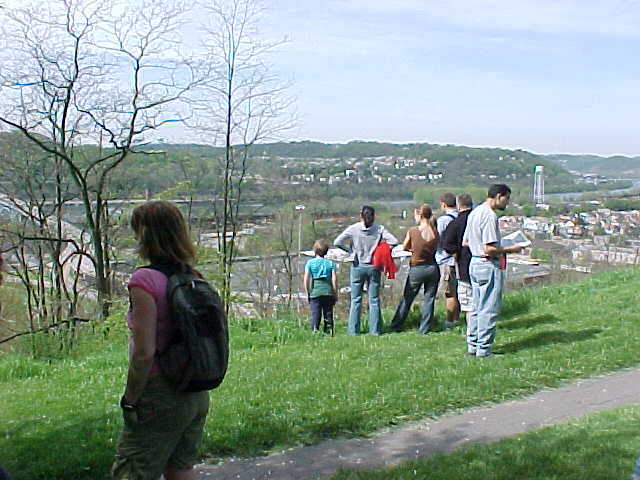 There’s a clearing where you can look down upon Aspinwall, Sharpsburg, and across the river, Highland Park. 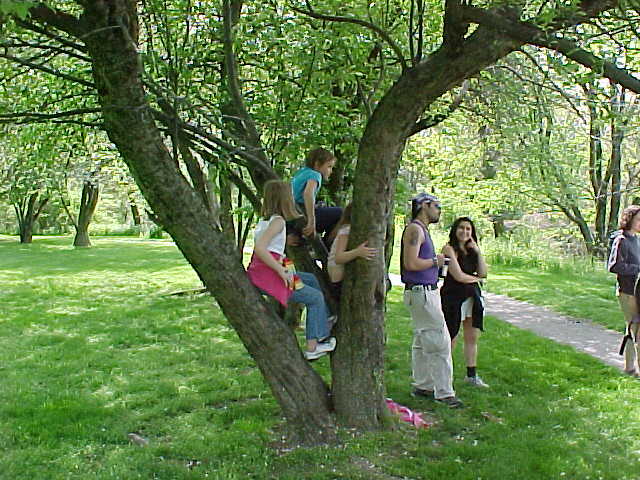 And like every good park should, it’s got sturdy trees for climbing. …into Camp Guyasuta, a Boy Scout camp. 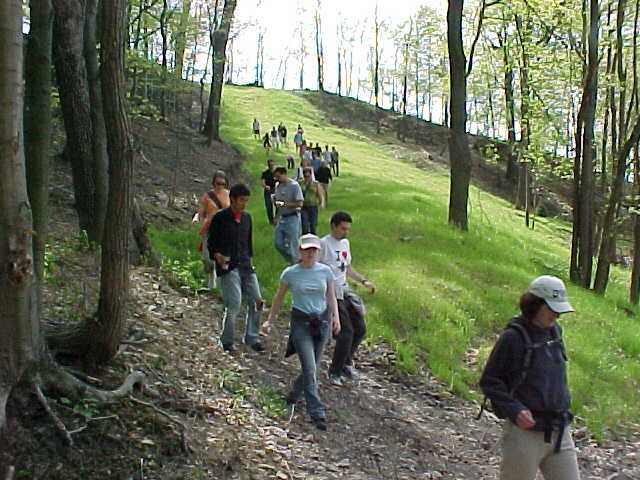 It’s open to the public for hiking-just check in with the ranger when you arrive. The camp also has cabins, a ropes course, paintball, and a swimming pool. 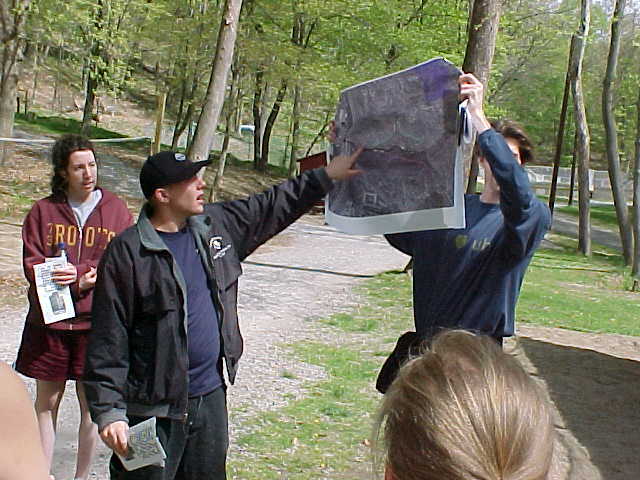 Tony Amrhein, one of the camp’s staff members, shows us on a map just how far back it goes. 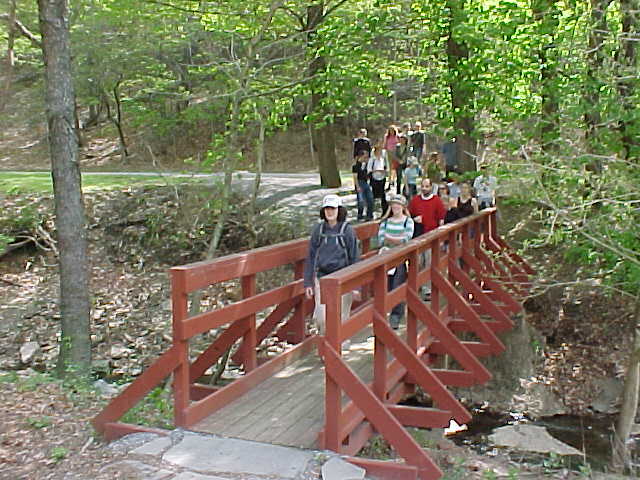 The camp is on about 165 acres of land tucked into a hollow below Route 28. There’s a waterfall all the way in the back. 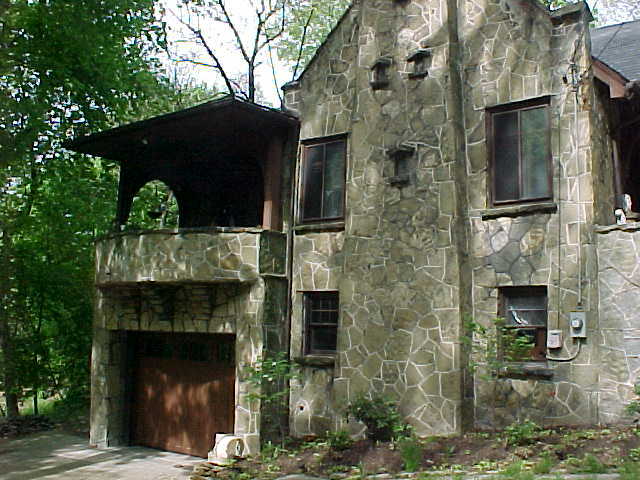 The camp’s McGinnis Education Center is available for meetings. The building is LEED certified, which means it has environmentally-friendly features. 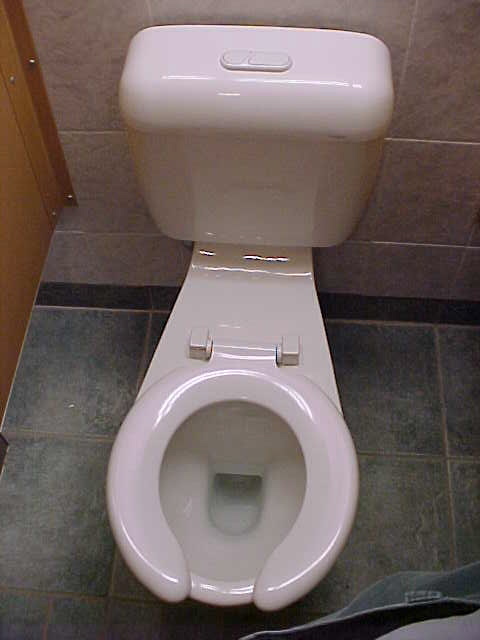 This toilet, for example, uses less water than standard models. That button on the top of the tank lets you choose between a small flush and a big flush. 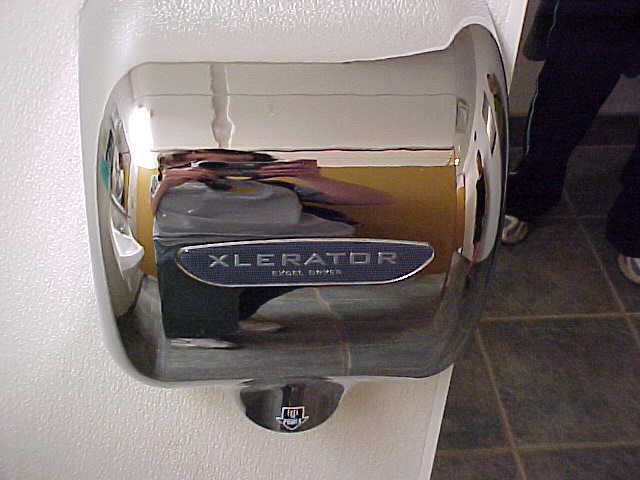 This dryer will blow your hands right off your arms. It sounds like a rocket ship and is probably about as powerful. 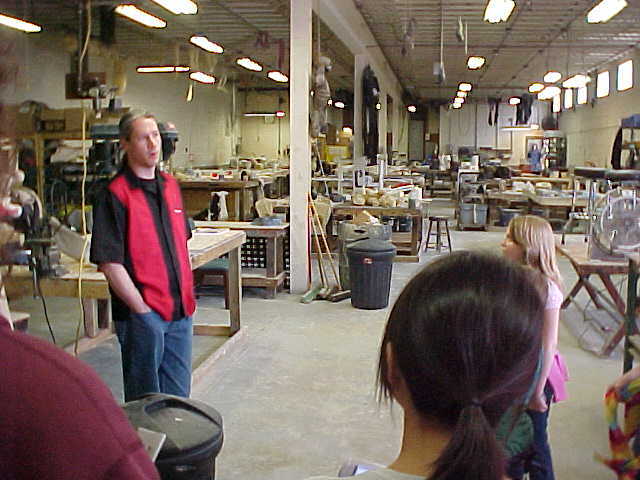 From the camp, we walk through an industrial park and into a semi-residential area in Sharpsburg. 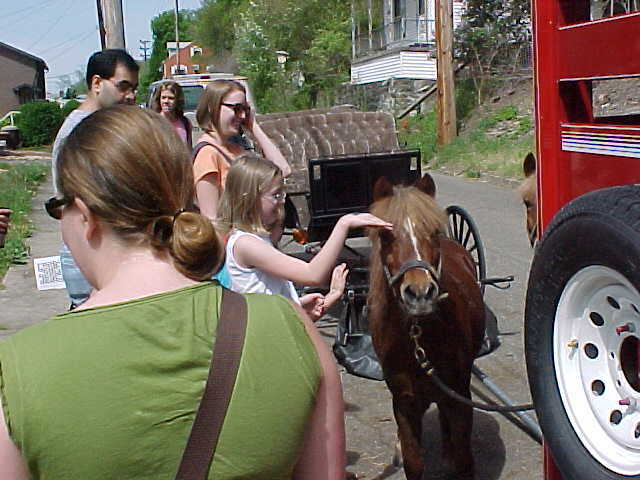 A couple of ponies are taking five after a busy morning of carriage rides. How cool is this sign? 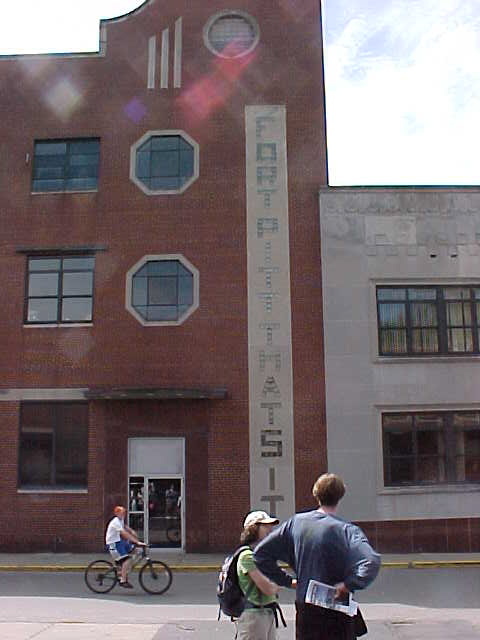 Unfortunately, Fort Pitt Brewing is no more. But its legacy is forever embedded in this huge building’s glass block lettering. This building is actually part of a bigger compound, connected by an overhead walkway. 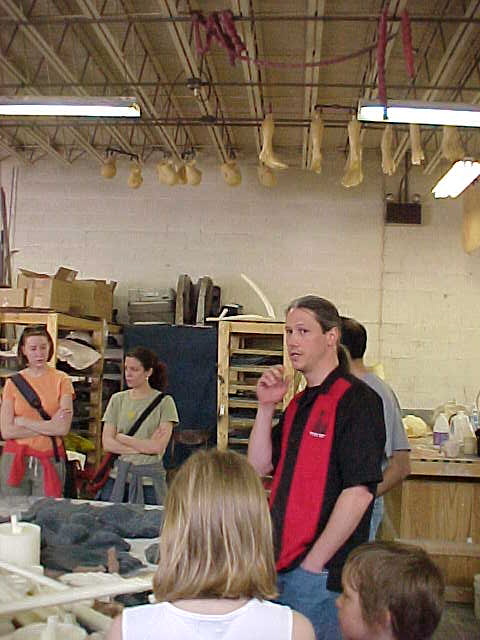 Keith Putt is waiting for us at Specter Studios, which makes masks, costumes and fake body parts. Know what the inside of a latex mask smells like? Imagine that times a thousand. Check out the fake legs, heads and intestines hanging from the ceiling. 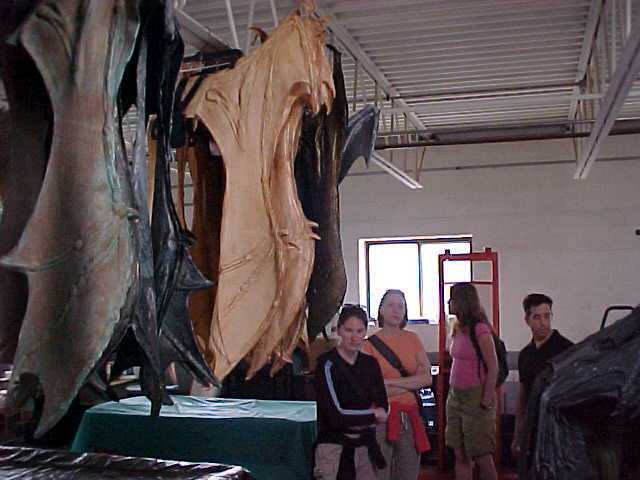 Upstairs, there are rows and rows of fake animal tails, corsets, and the company’s specialty, bat wings. 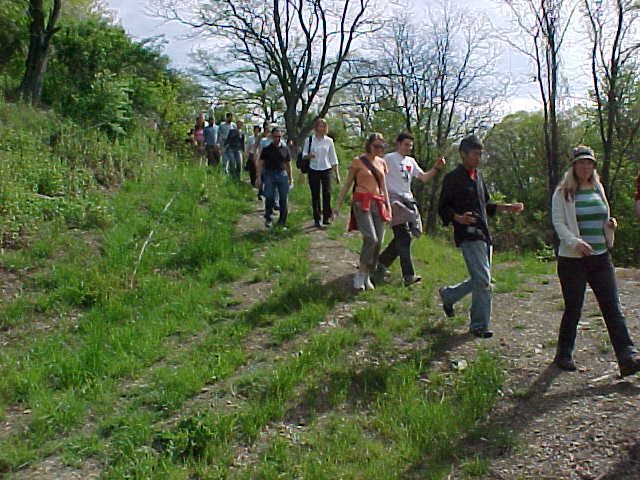 Hikers make their way to a really big median between North and South Canal Streets that’s actually somewhat of a park. Nearby side street Heinz Terrace also has a median. Henry J. Heinz was from Sharpsburg, and got his start in the food business by selling vegetables from his mother’s garden. The first Heinz factory was also in Sharpsburg. At the western edge of Sharpsburg is St. Mary’s Church. 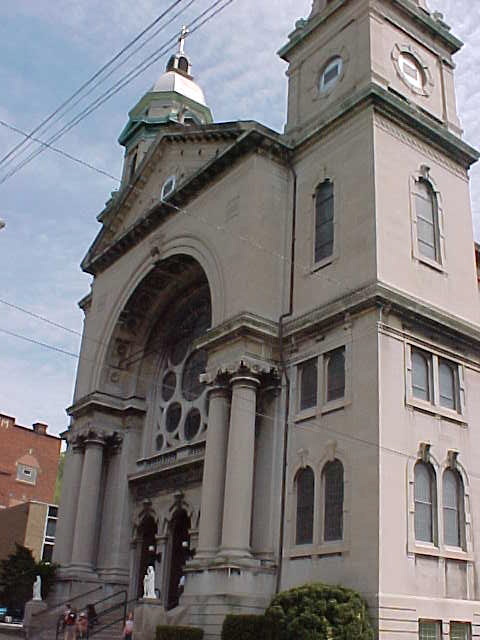 If you’ve ever passed Sharpsburg driving on Route 28, you’ve probably noticed St. Mary’s. The immense church is actually closed during our hike; parishioners go to a different church from the fall through Memorial Day to save on heating costs. 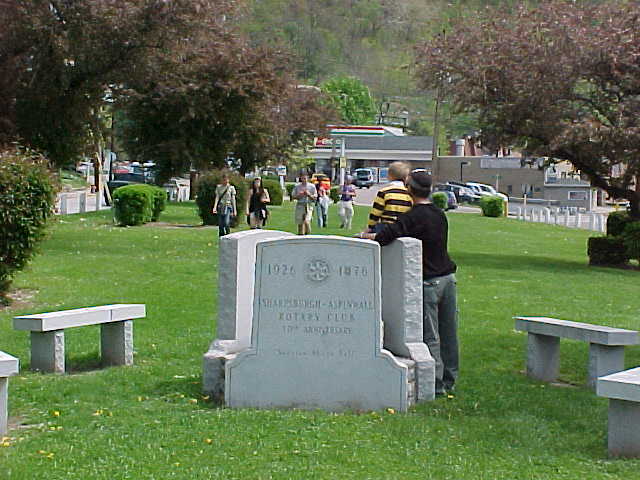 We hit Main Street and walk through Sharpsburg’s business district. We eventually come to a Y intersection, at which there’s a statue of Guyasuta. 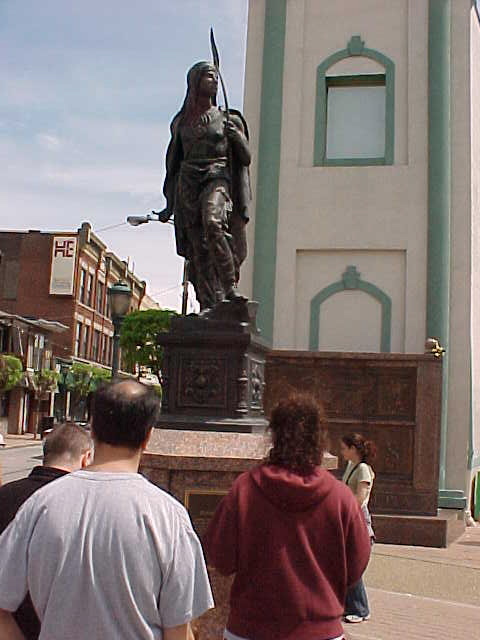 Sharpsburg is full of references to the Seneca leader who was a scout for George Washington. 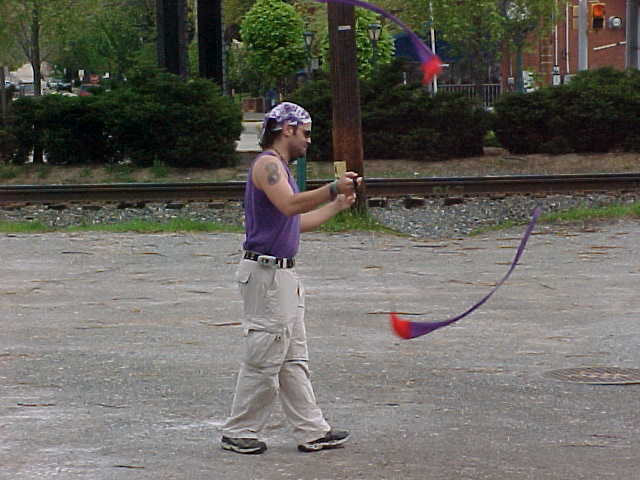 Sharpsburg was once formal tribal grounds for the Seneca. 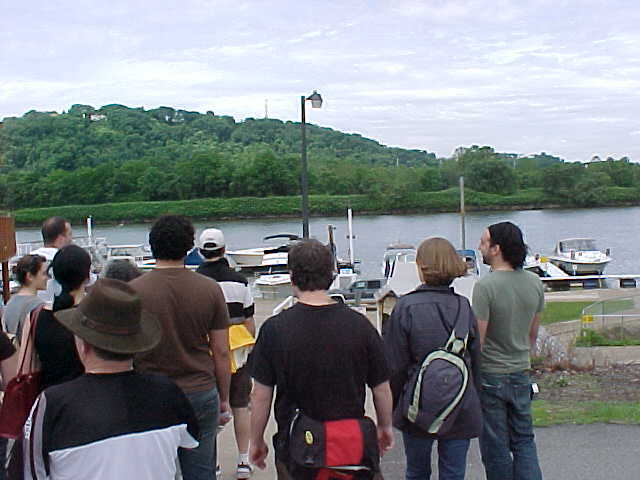 We take a short detour off of a long stretch of Main Street to see a marina down by the Allegheny River. This is also the site of Silky’s Crows Nest restaurant. In the distance you can see what looks like a white horizontal line on the river… that’s water flowing over a dam. The locks are on the right. 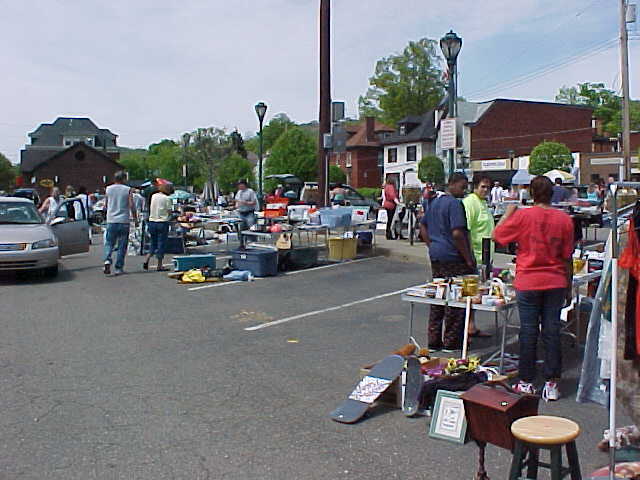 As we return to Aspinwall, we check out the wares at the neighborhood flea market. Pansies are a popular choice. 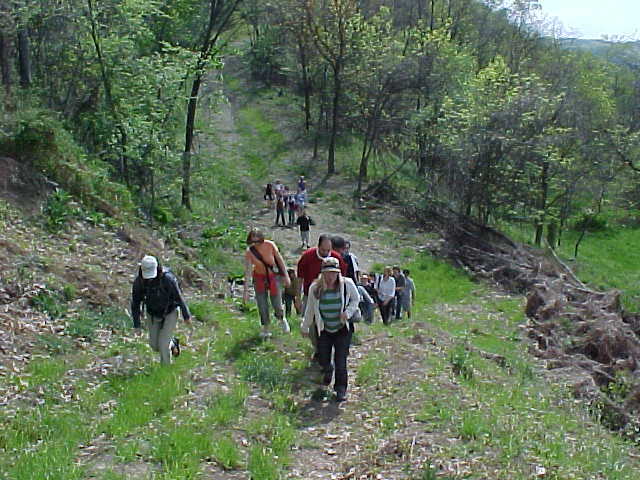 I am so happy to find other urban hikers. I have hiked in Chicago, Miami and now have moved to Philly. Your hikes are an inspiration.